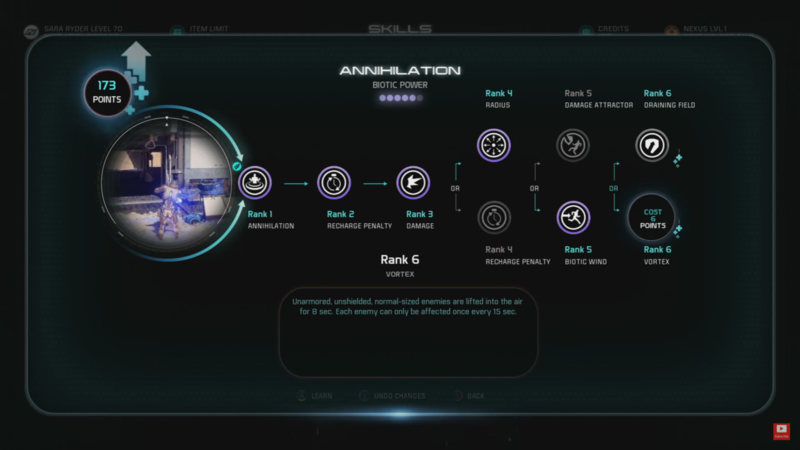 This is a Mass Effect Andromeda skills page on the Annihilation biotic power. Here you’ll find information about the plethora of dangerous skills used in Mass Effect Andromeda. Using rapidly shifting mass effect fields, this biotic power slowly damages nearby enemies. Note that enemies caught are primed for combo detonations. However, using Annihilation with other powers suffers the penalty of reduced recharge speed. Vortex 6 6 Infantry enemies with no armor nor shield will be lifted into the air for 8 seconds. Annihilation is important when you want to have a good biotic build and an infinite shield build. Annihilation primes unshielded enemies for combos as well as damages them. Trigger detonations with skills like lance and throw. To make a good shield build with this skill, choose radius, damage attractor, and draining field to help your shields regenerate even more.